Unlike other ladybird beetles, all species in this Subfamily Epilachninae are phytophagous. Both larvae and adults feed on plants. Usually the adults feed on the upper surface of leaves, while the larvae feeds on the lower surface. Some are pests on agricultural crops such as potatoes, pumpkin, turnips, radishes, beans and spinach. The larvae of Epilachninae can be distinguished from other ladybirds by their long branched spines on the back and sides. This 26-spotted Potato Ladybird looks very similar to the 28-spotted Potato Ladybird, can only be distinguished by counting the black spots on their body. We found that the 28-spotted Potato Ladybird is more common in Brisbane. 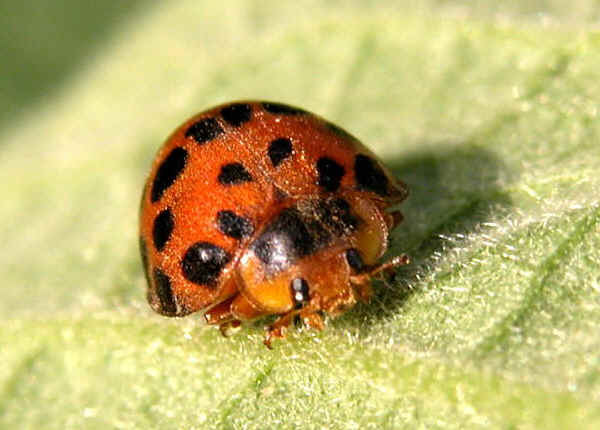 This ladybird is mostly found on potato leaves. They are relatively larger than other species. The adults are orange in colour. Carefully counted, there were 13 black spots on each wing cover, two spots on thorax, i.e. 28-spotted in total. There were the dense short hairs on its body. More information and pictures can be found on this page. Last updated: September 28, 2005.